Almost every person could use more space, right? Over the past few years, or even longer, I bet you’ve probably accumulated a ton of stuff that you just can’t throw away. Even if you’re not a “hoarder,” these items, many of which hold great sentimental value, need to go somewhere. But if they get in your way, you have a problem. Instead of dumping your stuff, take a look at steel buildings and invest in a steel storage unit! Steel buildings are usually half the cost when compared to traditional construction methods, and can be erected in half the time. Since steel garages are extremely easy to build, many first time builders elect to do the erection themselves, saving them the expense of a contractor. The construction process with steel is usually not affected by delays like traditional construction. Since the building just needs to be assembled and not fabricated on-site, there is hardly ever surprise cost increases. Also, since steel mini storage units are pre-engineered, they tend to be cheaper than wood buildings. Steel building projects don’t usually require an architect, either. Steel buildings utilize clear span design, which means there are no interior support columns or truss and cord systems hanging from the ceiling. Instead of those interior support mechanisms, a clear span building is engineered to ensure the walls and frames support the weight of the roof. Loads are transferred from the roof to the foundation, leaving the entire area open and available. Obviously, with pole barns, you’re losing valuable space with wooden trusses in the ceiling, as well as the interior columns. If you’re looking to store your extra possessions, why not use all of the space and not be hindered by interruptions? Store all your heavy equipment without any trouble! As you continue to add more stuff in your garage, you might need even more space than originally anticipated. Expansion is much easier than brick or wood construction. With bolt-together connections and pre-punched holes, most components are precut and numbered to correspond with your drawings for quick assembly. If you’re thinking of expansion in the future to accommodate more stuff, it’s relatively simple to unbolt and expand with more components from the manufacturer. With wood and brick, most likely you’ll have to erect a new structure or go through an expensive remodel. When you purchase from a steel building manufacturer like Armstrong Steel, your materials will arrive to your job site ready for erection, unlike most pole barns or brick and mortar buildings, which must be fabricated on site. Generally, steel buildings can be erected in days or weeks, not months or years. Steel is the most durable construction material on the planet. Because of this fact, insurance companies acknowledge that durability and lifespan of steel buildings, and many times, offer customers extra savings on their premiums. Steel buildings are extremely resistant to fire. The more fire resistant a building is, the more cost effective it is to insure. Steel buildings are completely customizable, but that doesn’t mean strictly the interior, dimensions or accessories. Thanks to modern construction technology, a steel building doesn’t have to look like a boxy warehouse or a simple metal garage anymore. Of course, if that’s the look you’re going for, and then you’re all set! 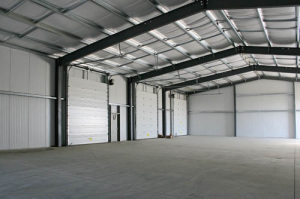 However, steel buildings can be designed to your exact specifications and style preferences. You can pick your color, add siding or different finishes, and personalize your steel storage unit to your aesthetic needs. Who wants to replace parts every couple of years? That’s how wooden pole barns end up becoming costly. Wood has the potential to rot, crack, bend and warp, and is susceptible to pests like termites or fungus like mold and mildew. Quality steel buildings will come with long structural warranties, with additional warranties on paint, roof panels and wall panels. Steel building components will last for decades without failure, and are nearly maintenance free. 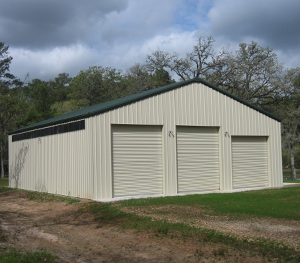 Can you think of any other benefits to steel buildings as storage units? Start the conversation below! What is Your Role in a Steel Building Project? Weld-up or Bolt-up Steel Buildings: Which is Better?